How do I sync my photos to FotoIN Studio? If you are opening FotoIN Studio for the first time, you will not see any photos. To sync your photos to FotoIN studio, open Sync in the top left, and click Sync All. This will sync your FotoIN photos to FotoIN Studio and they will appear in the middle column. How do I sync only new photos? To sync only your new photos, open the sync menu and select Get New. This will only sync the new photos captured since the last time you performed a sync in FotoIN Studio. I have made changes to my photos on FotoIN Studio, how do I save them to my FotoIN account? Once you are finished making changes/updating your photos in FotoIN Studio, select Upload Changes from the sync menu. This will sync the changes you have made so they are reflected in your FotoIN account. How do I import photos into FotoIN Studio? Will they automatically sync to my FotoIN account? To import photos into FotoIN Studio, open the import section on FotoIN Studio. Next, click Select Image Files, choose which photo(s) you would like import, and click Open. 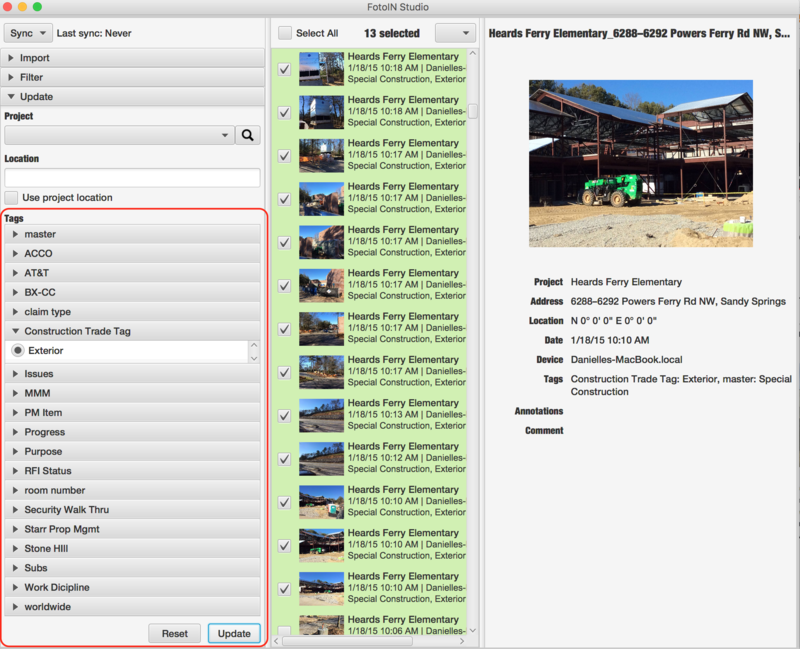 Select a project from the dropdown to assign the photos to, or check the box that says ‘Detect project from photo GPS’. Click Import and the photos will appear within FotoIN Studio, highlighted green. Remember to click Upload Changes from the sync menu (top left) to see the imported photos within your entire FotoIN account. How do I find a specific photo in FotoIN Studio? Open the Filter section on the left side to search or filter through your FotoIN photos. Begin by typing a keyword or phrase into the search bar. Make sure you hit Enter and all the photos that fit your search will appear to the right. To clear the search, hit "X" next to the search bar. Narrow down the search further by choosing the status of the photo(s) - Any, Updated, or New. Filter through photos by opening any of the filter dropdowns and selecting the options you wish to filter by. You can filter by project, address, device or date. Narrow down the filter further by choosing the status of the photo(s) - Any, Updated, or New. When you are finished selecting the filter options, click Apply. All the photos that fit your filter criteria will appear to the right. To clear the filter and return to the full photo view, click Reset. How do I update the assigned project for a group of photos? First, make sure you have synced all your photos or any new photos to FotoIN Studio. Next, open Update on the left side - this is where you can update the project name for your photo(s). Checkmark the photos you would like to update, then open the project drop-down list. 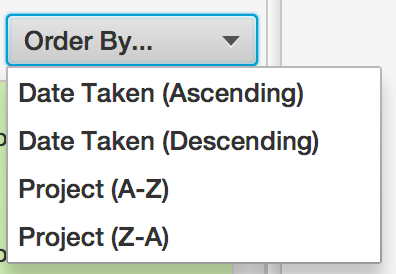 Select the new project name you would like to assign to the selected photos. Next, choose to either manually enter in the location (address) or, if you want to use the address associated with the project, check the box for 'Use Project Location'. 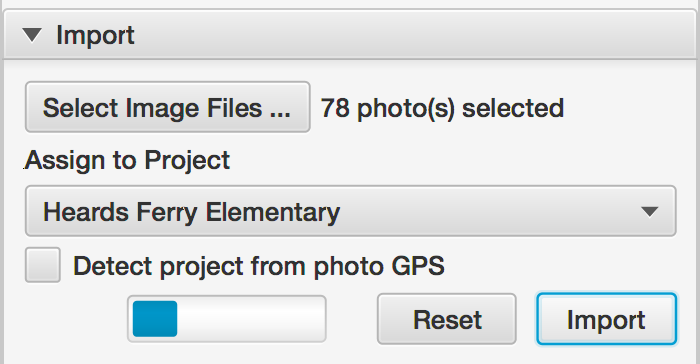 Lastly, click Update to assign the new project name to your selected photos. Don’t forget to ‘Upload Changes’ to sync your updated photos to your FotoIN account. How do I update the tag selections for my photos? Next, open Update on the left side - this is where you can update the tags for your photo(s). Checkmark the photos you would like to update, then open the tag category(s) and start selecting the value(s) you would like to apply. Click Update at the bottom and the selected photos will be highlighted green. Don't forget save these changes to your FotoIN account by selecting 'Upload Changes' from the sync menu. I want to update all of my photos. Is there an easier way than selecting them one by one? To select all of your photos in FotoIN Studio, click Select All above the list of photos on the left side. This will make it faster when updating all of your photos at once. Can I change the ordering of the photos within FotoIN Studio?